The ST Foundation’s key program is called Digital Unify (DU). 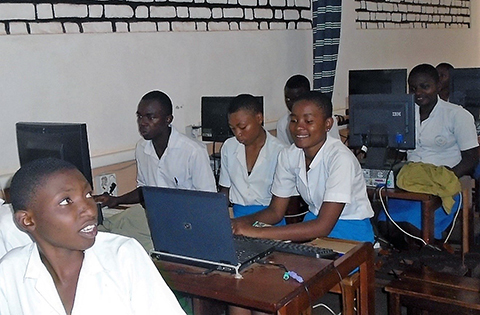 It aims at spreading the benefits of digital technology, by providing free of cost both the technology as well as basics informatics training courses to those who have no knowledge of how to use a personal computer and access the internet. Its key beneficiaries are disadvantaged people from the minimum age of 14 years old. In details the program consists in the setting up of computer training centers (Labs), collaborating with local partners such as secondary schools, NGOs, local administrations and the like and the spearheading of a free computer literacy course called Informatics and Computer Basics (ICB). Training centers are set up following specific guidelines (i.e. the Model Lab Approach) that suggest a specific layout and equipment: standard hardware features and defined characteristics, which make it suitable to be used worldwide in all DU labs. They typically consists of 11 PCs, internet connection and, when needed, a Photovoltaic System. Once the training center is set up the Foundation provides trainers, STMicroelectronics volunteers, who through a “train the trainers” course will train local informatics teachers to teach a basic informatics course (ICB) which is spearheaded free of cost. The ICB course which last 20 hours is based on a Power Point Manuals which is regularly updated and follows basic rules. Through a “train the trainers” course ST volunteers prepare local informatics teacher to give the course.